Ulta Stock Analysis: Can Cosmetics Lead to Attractive Long-Term Earnings? While the cosmetics industry may not be seem like one investors would get overly excited about, Ulta stock has had incredible growth in recent years. Can it keep up its earnings performance? Ulta Salon, Cosmetics, and Fragrance (NASDAQ:ULTA), the $16 billion beauty and cosmetics company, has a history of earnings performance that has made its investors very happy, but can the company continue to rise in the future? Here's an analysis of Ulta stock's history and performance that may shed light on why this cosmetics company could have plenty of room to keep going up. 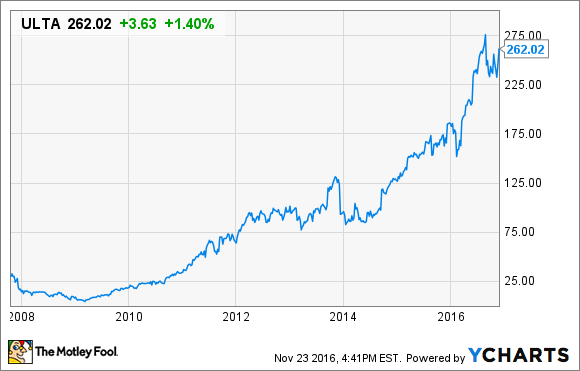 Ulta stock has been a 10-bagger for investors who held on since around 2010, rising more than 900% in the last 10 years. Even in just the last two years, the stock price has more than doubled. The few times that the stock has taken a little breather, as seen in the dips around Jan. 2014 and Jan. 2016 in the chart below, have been because of what seemed like slowing growth. The stock each time quickly continued its upward trend. There are multiple reasons why Ulta's share price has risen so steadily in recent years, but the main one is the company's steady earnings growth. Ulta's earnings have grown 10 times over in less than six years in a straight line upward since 2010. While Ulta doesn't offer a dividend, its relatively fast but stable share price growth has made it an attractive stock for many investors. ULTA normalized diluted EPS (TTM) data by YCharts. Is this cosmetics company a good long-term investment? In terms of valuation, Ulta stock has certainly become higher priced as investors have seen the steady growth that this company can offer. At 46 times earnings, this stock is trading at a multiple also given to many growing tech firms and other business where investors expect quick growth in the years to come. What could drive this kind of growth for Ulta that makes its relatively high price to earnings worth betting on? For one, Ulta has been consistently growing its footprint while also guiding for higher total store count in the U.S. Ulta has grown to over 900 stores as of Q2 2016. During that release, management raised its future store count guidance from 1,200 stores, to a range of 1,400 to 1,700 total in the U.S. By nearly doubling its store count, Ulta's earnings have the potential to continue growing steadily in the years to come -- and that's not even taking into account the potential for international growth. Of course, the leading risk factor for Ulta is that the company will lose ground to third-party online sellers. However, Ulta has done a great job so far of staying ahead of this risk. By offering exclusive product demos and salon experiences with beauty experts inside its stores, Ulta provides an experience that customers wouldn't be able to get online. Also, by successfully increasing its own online presence with exclusive product how-to videos on its site and a loyalty program, that keeps customers going back to Ulta.com instead of third-party online shops. Ulta's e-commerce sales jumped 55% year over year in the most recent quarter, representing around 20% of total sales, and its loyalty program has more than 20 million members. There's no doubt that the stock looks pricey now, and waiting for a small pullback could be a good idea. 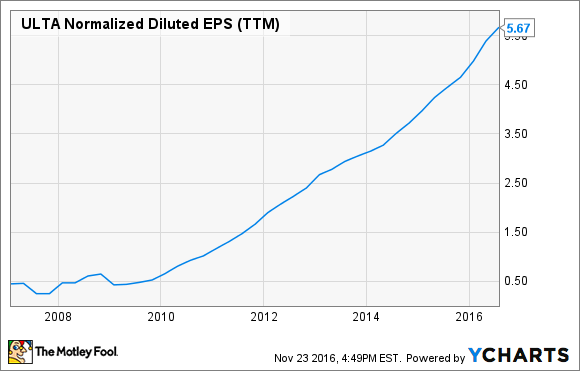 However, analysts expect EPS to come in at $7.84 next year, putting the forward P/E estimate by 2017 earnings at a more palatable 33 times. Though that's still not especially cheap, for investors who believe that Ulta's clearly successful business model can continue to drive EPS growth in the next five to 10 years like it has in the past, that price could be very attractive.